Samsung show off their Homesync: Cloud storage, sharing and streaming in a box! MWC seems like a surprising place to show off an new connected-sharing box, but that's how Samsung are rolling at this event. 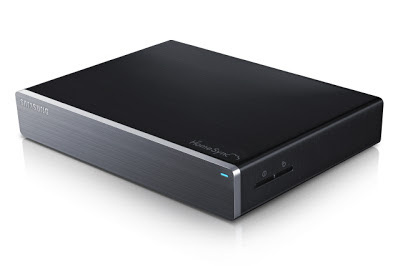 Today they've shown off their new HomeSync device, essentially this is a smart box which is powered by a 1.7GHz dual-core CPU, Android Jelly Bean, 1GB of RAM, 8GB Flash memory, a 1TB HDD and has connectivity options which include Bluetooth 4.0, WiFi 802.11n 2.4 & 5GHz, Gigabit Ethernet and HDMI 1.4 output. "The best of Android gaming, movies, TV shows and streaming content direct into your living room. It allows you to stream content from your Galaxy device wirelessly to the TV – letting you watch, see and use all your home videos, photos and apps, and all at a full HD 1080p." The box supports up to eight individual password-protected and encrypted user accounts and each has the ability to collect content from other devices and pump it out to other accounts. Now this isn't a Google TV, but you do have Play Store access and you can control the device direct from your phone. At the moment there's no word on pricing, but it will be available in select countries in April!